Bolivian bus companies don’t exactly have the best reputation. Rumours abound about “bone jarring” dirt roads and passengers having to help push bogged buses. 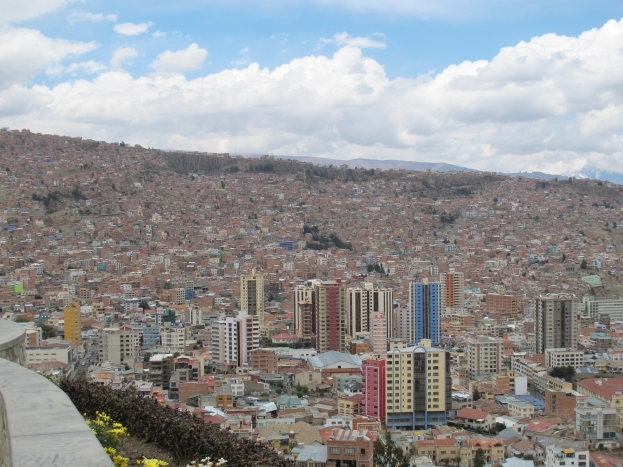 But after a number of comfortable rides, we figured everyone had been overreacting … until we caught a bus to Bolivia’s capital La Paz. We hunted down Boliviar bus lines, who are reported to be one of the country’s most reliable companiesand were stoked to discover we’d scored a ride in big lounge chairs, with only three across each row. We reclined our seats, rested our feet on the foot rests and got ready for seven hours of Bolivian scenery. After about six and a half hours, the bus came to a complete stop. Looking out the window, we appeared to be stuck in a traffic jam. All of the other passengers disembarked, so we followed and through sign language with the bus driver, realised we had to collect our bags. “La Paz?” we asked. “Si,” he replied. 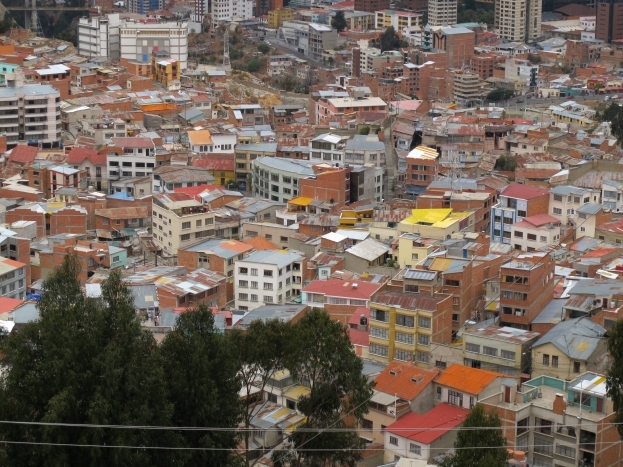 At about 4000m above sea level, La Paz is famed for being the world’s highest capital, and all the descriptions we’d read of the city described a cascading sea of buildings, spilling down the edge of a mountain. We’d stopped on a long straight highway and the only mountains we could see were in the far distance. 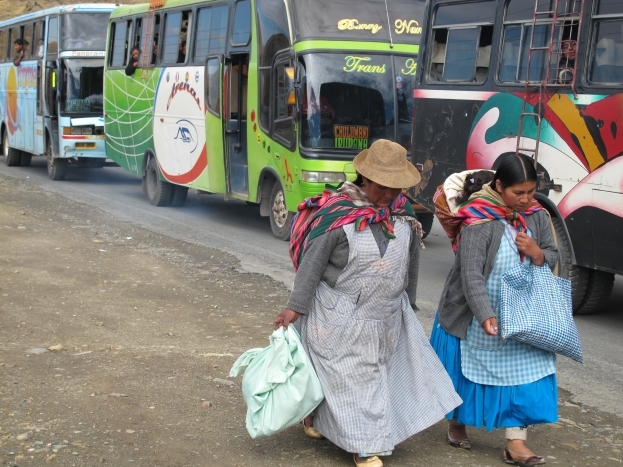 Local Bolivians swarmed across the road and as we started walking in the direction of some of the other bus passengers, we realised we were in the middle of a protest. Empty buses lined the roads, but there wasn’t another backpacker or English speaker in sight to give us some idea of where on earth we were. Our “Spanglish” clearly wasn’t going to work, so we did what we do best – started walking. After about half an hour, the scenery hadn’t changed. People were cooking meals on the road, children were playing soccer, but there wasn’t a taxi or bus in sight. We asked a couple of people “Donde esta La Paz?” (Where is La Paz?) and they pointed vaguely in the direction we were walking, so we kept going. Eventually we were approached by a man with a mini van. He had a kind face, so we ignored the guidebook warnings not to get into cars with strangers and climbed aboard his crowded van. About 40 minutes later, he dropped us in the middle of a hustling, bustling area. The streets were so crowded with people and traffic that we hardly fit on the footpath with our “mochillas” (backpacks). We managed to find a street full of bus companies and through more broken Spanish received instructions that we had to catch a “collectivo” (a mini van that operates like a public bus) to La Paz. Once we boarded one, we started to descend down a long, sweeping hill and were finally confident we were close to our destination. We were dropped off somewhere in the city, so hailed a cab to take us to our hostel. Three hours after our scheduled arrival time, we dropped our bags in our room. Despite how stressful the situation was, it turned out to be a good experience that highlighted the kindness of the Bolivian people. Later we found out the locals were protesting about a new highway getting built. Waking up the next morning, we were keen to check out the city. We were staying near the valley floor, and from there, the city spread up and out in every direction. It was loud and busy, but had a wonderful energy about it – we quickly gave the place two thumbs up. Wandering around the “witches market” is an experience to remember. 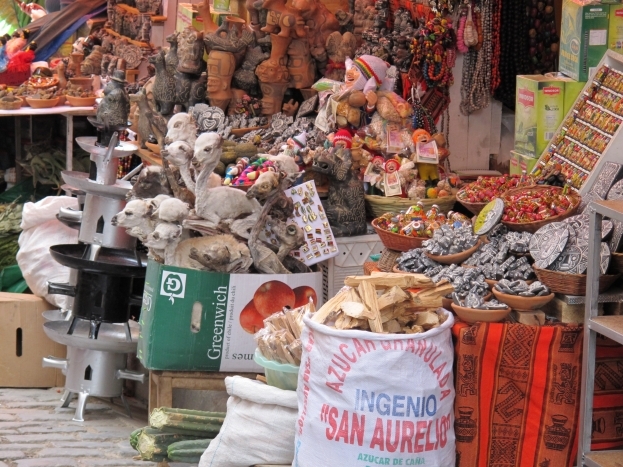 On top of the usual fruit, vegetables, herbs and touristy merchandise of other South American markets, the La Paz Witches Market offers dried Llama fetuses that locals bury under their front porches for good luck. 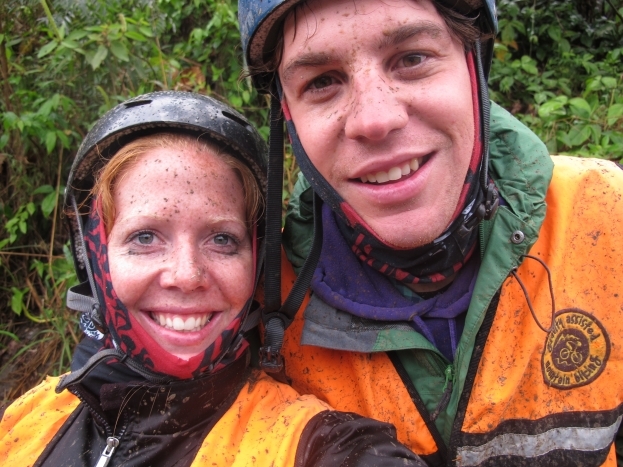 The other “must do” activity in La Paz is to cycle the World’s Most Dangerous Road. 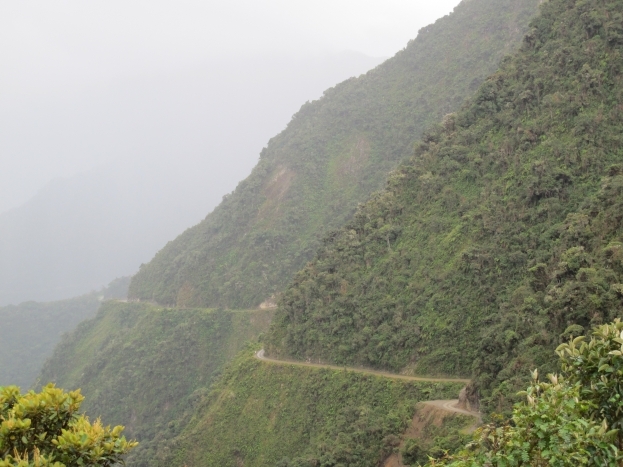 Until March 2007, it was the main thoroughfare between La Cumbre, outside La Paz, and Coroico. Its name is no exageration – an average of 26 vehicles went off the edge each year. One dirt lane winds along the steep cliffsides, meaning passing vehicles easily became part of the scenery. 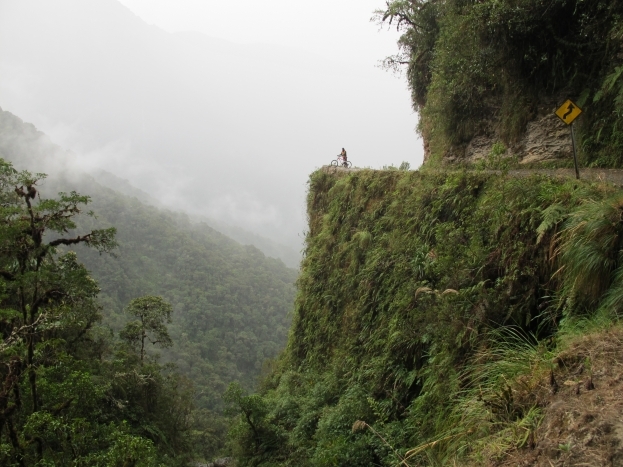 These days there’s an alternative paved road, and the original track is used mostly by daring cyclists who want to claim they’ve cycled “Death Road”. We signed up with the most reputable company, Gravity. Despite being almost double the cost of its competitors, they service their bikes after each ride and have heaps of safety equipment for anyone who comes a cropper. Safety certainly was the priority. Our guide Lincoln wasn’t scared to share every cycling horror story that had happened on the road since people started riding it. From a girl whose brakes failed (who went with a cheaper company) to the countless stories of people who had stumbled over the edge, we were under no illusions that what we were about to undertake could be risky if you weren’t careful. But after 60km, three hours of rain, snow and sunshine, our group of 12 all arrived safely at the bottom without injury. The scenery was unbelievable and once you got the hang of the bumpy track, it wasn’t too scary. However if you’re afraid of getting dirty, then this is not the activity for you.. 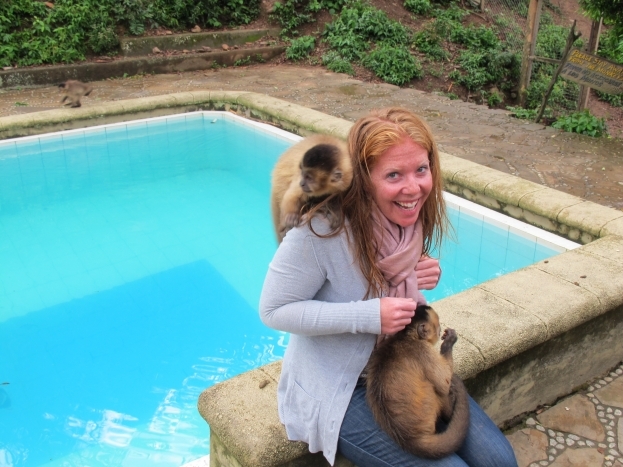 The ride ended at the La Sende Verde animal sanctuary where we were treated to drinks, a pasta buffet and a play with some very inquisitive monkeys. The sanctuary, which is basically run by volunteers, saves animals from the black market. A lot of the monkeys were trained pickpockets, so we were warned to remove anything of value before we entered their area. After a hairy bus ride back up Death Road, we finally got back to the hostel where we had a couple of drinks then called it a night, knowing we were heading to the great Lake Titicaca early the next morning.